With Once Upon a Time, Christensen brings life to the rich and delightful creatures who filled his imagination as a child. 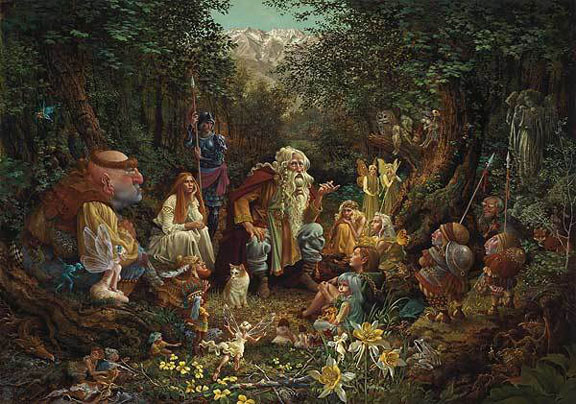 The wise, magical storyteller tells his astonishing fables to the wondrous characters who are usually in those fables. "I've made up characters, but I've also drawn some of them from art and literature," explains Christensen. "The Lord of the Rings remind us that adults are interested in fantasy, too." And James pays tribute to Ian Ballantine, the publisher who popularized The Lord of the Rings in the United States by releaseing it in paperback. "He is the keybearer on the right. In a sense, he brought me this talisman."